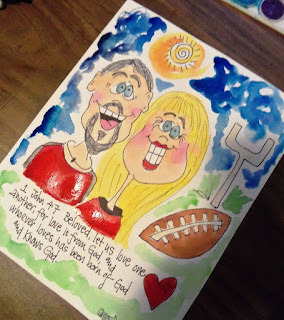 Here is a customized painting I did several years ago for a client who placed this order for a Christmas gift. She gave me a photo of the two I hand drew and hand painted, along with the quote and this was the end result. All paintings are original one of a kind pieces of art by yours truly. I also spray each painting with a fixative so the watercolor paints stay true to color and they do not run if accidentally wet. It is now up to the client to frame my watercolor paintings.